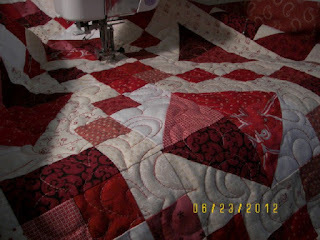 Yesterday, I was able to get this quilt sandwiched, early in the morning, before the horrid heat. Today is expected to be near 105 deagrees, so what am I doing, quilting! LOL! This design is so similar to one I frequently do, but more carefree, lighthearted and "open". It's kinda "posey-like". Kinda like daisy, flowery, but still "cute." Look at my backing! Is this not over-the-top??? It was on sale, and the ONLY one that would "do", colorwise. I am usually NOT a florally person. 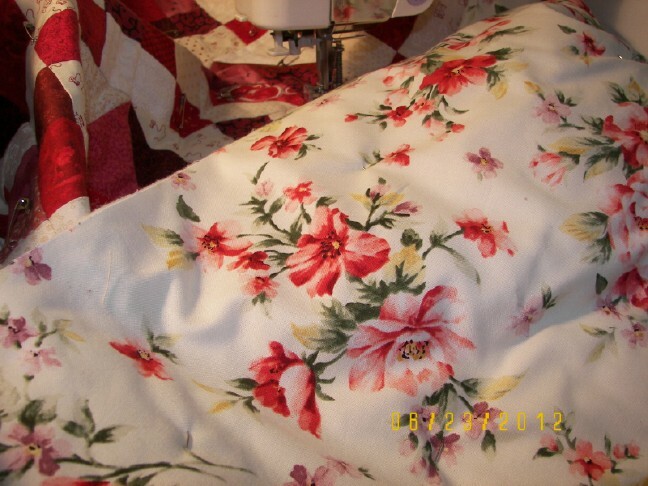 The quilting thread is a variegated redish/pinky and the thread on the back is a beigy white. Both are working well. On another subject; Happily, the OWLS are still in the neighborhood. Last night, as I was closing up the back door for the night, there were two "lumpy dark things" on the deck rail. Yeppers, two of the little owls - they looked back at me with their lovely huge eyes, and their heads circling so humorously - I know it's silly, but I almost thought they wanted to "connect" with me! LOL I didn't want to scare them with my camera - sorry no photos. They have also been spotted in another person's trees, nearby. It's not hard to find them during the day if one just listens for other birds, (robins, jays,) who put up such a racket if the owls are roosting nearby. Love the red and white and the quilting looks fabulous! YES! Me too, me too. When I become a FMQer I wanna be as good as you. 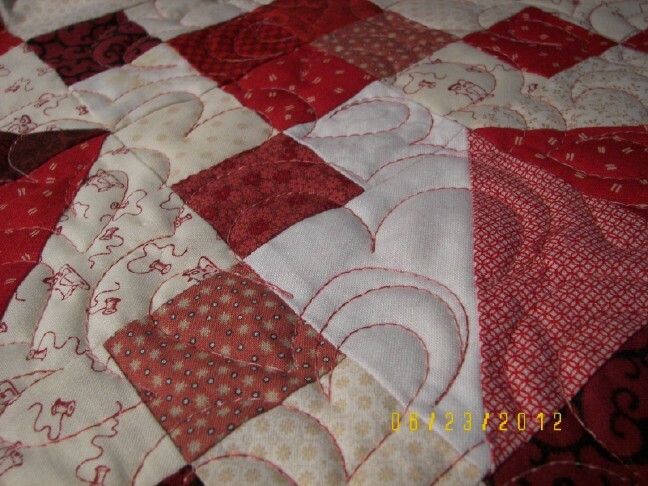 Your quilting looks really great! I was thinking of a similar style for a quilt I recently sandwiched, but I've never free motioned with my current machine! I'm inspired! Elaine, your quilting is sooooo good! And I love your choices of thread and backing fabric. It is gonna be a prize-winner at the fairs!